So, one of the things that happened during my lengthy blogging hiatus is that I bought one of these. The car, not the child. It’s a Nissan Leaf or as it is regularly referred to, a milk float. But don’t worry, I haven’t started wearing sandals and socks or turned into a vegan. I bought it mainly because I wanted a new car and this was a cheap way of doing it (next to zero running costs) and because it satisfied my inner geek. The fact that sucking dead dinosaurs out of the ground and setting fire to them to get around town is a bit Victorian and not very sustainable was a minor consideration too. My plan was to eventually run the car for free using free public charging points and almost a year after buying it I’m on target to get my first month of free driving. I’ve been hampered somewhat for the last year due to my long-standing knee problems significantly limiting the distance I could walk. But in January I got a brand new knee cobbled together from some off-cuts of titanium, cobalt-chromium and plastic that they had kicking about in the hospital and I’m now able to walk further than I could at the start of this year so I can now plug in to one of the chargers at my local Asda for a few hours and walk to the office. Thanks to my electricity provider (OVO) I can charge for free at 6,000 or so chargers including that one. Now, the chances are you’ve scoffed either out loud or in your head at the idea of ditching the Postman Pat van and driving a glorified milk float. They only last for 30 miles, they take 18 hours to charge, they’re slow, the batteries set on fire and there’s hardly anywhere to charge them up when you need to. That’s what everyone knows about electric cars and it’s why Amazon hired lawyers to sit in the car with Jeremy Clarkson when he reviewed a Tesla after he was sued by Tesla following his last review of one of their cars (yes, I know they were taking the piss but he really did get sued by Tesla for misleading viewers). My Leaf is the middle of the range model with the smallest battery and slowest charger. Most of my driving is local so I don’t need to be able to drive 130 miles or so without stopping and I don’t need to be able to charge in 4 hours at home, I can do it in half an hour at the motorway services a couple of miles away for a fiver if I’m that desperate. With the exception of mid-Wales which is as much a charging desert as it is for petrol stations, there are rapid chargers pretty much everywhere you need to go. These will charge the car to about 80% in about half an hour and because Ecotricity’s owner, David Vince, is more interested in supporting animal rights terrorists PETA, trying to turn the country vegan and playing at owning a football club they haven’t bothered fixing the unreliable GPRS modules in their chargers so they often lose connectivity and default to free charging. But even when they’re not free it’ll only cost £5-6 for a charge which is still cheaper than petrol or diesel. Fully charging at home (or Asda) takes about 8 hours from empty although I rarely let it get that low. I have driven 115 miles from Telford to London for free, charging at Nissan garages. Last week I drove from Telford to Birmingham and back for free, charging at the Nissan garage in Stourbridge on the way home so I would still have half a battery when I got home and wouldn’t need to use my home charger. The other weekend I drove from Telford to IKEA in Wednesbury, paid about £3.80 to charge and they refunded me £6 for charging so I actually made a profit! For a tight-arse like me there is immense enjoyment from getting someone else to pay for your “fuel”. Real world range varies (like in a petrol of diesel car) depending on the temperature and the weather conditions. If it’s cold range declines, just like a petrol or diesel car. Same goes for if it’s raining or snowing or if you’re driving into the wind or if you’re driving up and down hills or if you drive it like it’s stolen. All the things that affect range in a petrol or diesel car affect range in an electric car but with a smaller maximum range in an electric car the effect is more obvious. During the winter, driving in the cold and bad weather my ranged probably dropped to about 65-70 miles but in the summer on a motorway journey in a heat wave I was getting closer to 100 miles. My morning commute is 6 miles and just 3 miles home. I’m not sure where the idea that electric cars are slow came from but anyone who’s tried to sit on the back of a milk float without holding on will know that electric motors give you near instant acceleration and constant torque. My Leaf will beat most family cars and boy racers off the line at the traffic lights. It is slower than a petrol or diesel car when you get to about 50mph and only has a top speed of about 100mph but it is by no means slow. The batteries are all in the floor pan as well so it has a low centre of gravity and corners well. You can’t legally drive above 70mph in this country anyway and as I said, I mainly drive around town so low end acceleration is all I need to satisfy the speed demon in me. Finally, the suggestion that a lithium ion battery is somehow more likely to set on fire than a tank of petrol is laughable. Of course there is potential for batteries to set on fire but which would you feel more comfortable holding over a flame? A car battery or a jerry can of petrol? 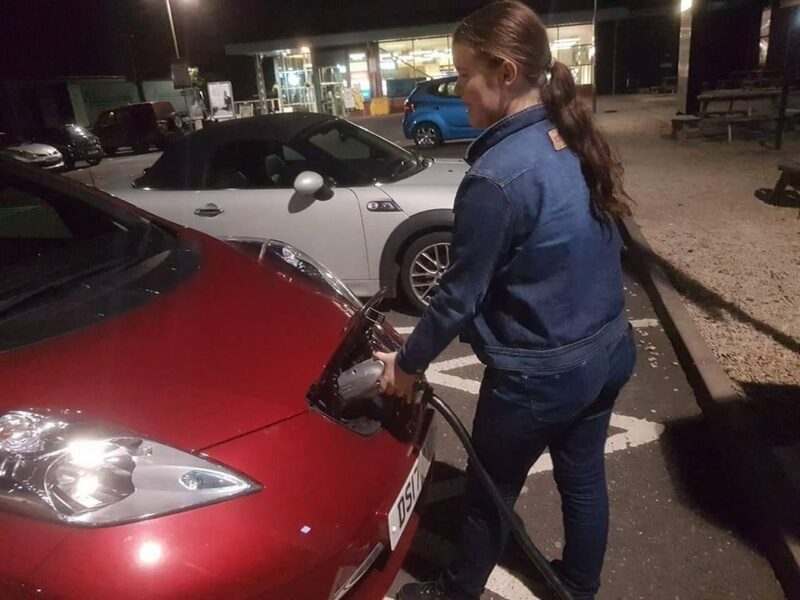 Electric cars aren’t for everyone (not at the current level of technology at least) but it works for me and more than 150k other people who own and drive electric vehicles in the UK. There are a lot of misconceptions about them and a lot of people have an irrational attachment to the 600 mile range of their dirty diesel despite never having driven for 10 hours straight in their life and will probably never do so. Driving an electric car has made driving fun again and to be honest the biggest inconvenience about driving an electric car is lazy and/or selfish people parking their petrol and diesel cars in electric vehicle charging bays!